The sign says “ASK HERE,” and ask you shall! At least, that’s what we hope. The Research Help Desk is the library’s epicenter for all things “research.” Need to check if the we own a particular book? ASK. Want help figuring out the best database to search for your research topic? ASK. Don’t know how to search said database upon becoming cognizant of its existence? ASK. No idea where to start, or what types of sources you could be consulting for your assignment? ASK. Just need someone to talk to? Okay, fine, but please do try to slip a library-related question in here and there. 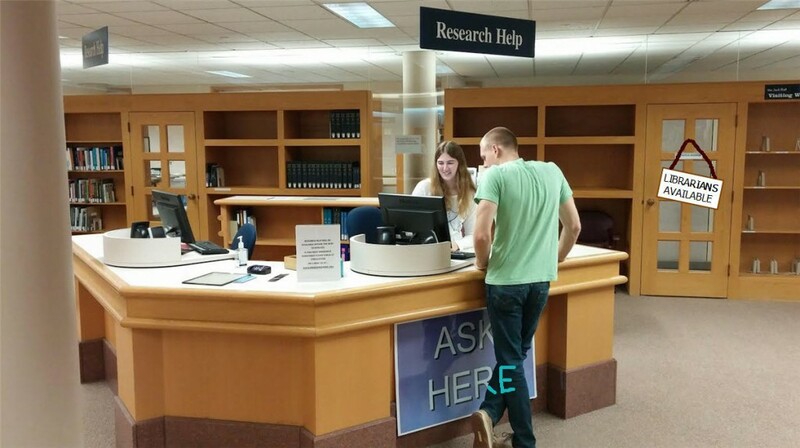 Oh, and about those changes afoot mentioned in the title of this post: Starting this fall, the Research Help Desk will be solely staffed by students—highly trained and knowledgeable students. Librarians, situated in the office suite directly behind the Research Help Desk, will be standing by for any and all research inquiries requiring their expertise. As always, help will be available both at the point-of-need (i.e., walk-up questions) and via scheduled research consultations. The Library is pleased to announce the availability of Films on Demand, a new campus-wide digital video-streaming database. Films on Demand includes educational films from some of the best producers, including the BBC, MacNeil/Lehrer Productions, Open University, PBS, A&E, National Geographic, Bill Moyers, ABC, NBC, CNBC, California Newsreel, WNET/Thirteen, TED, Films for the Humanities & Sciences, Canadian Broadcasting Corporation, and more. The films, which are broken into segments, can be embedded in webpages or Moodle. Playlists can be created using segments taken from any number of full-length videos. Our package includes 11,000 titles in the arts, humanities and social sciences and 4,000 titles from the Archival Films & Newsreel collection. Interactive transcripts and Closed Captioning are available for many of the videos. 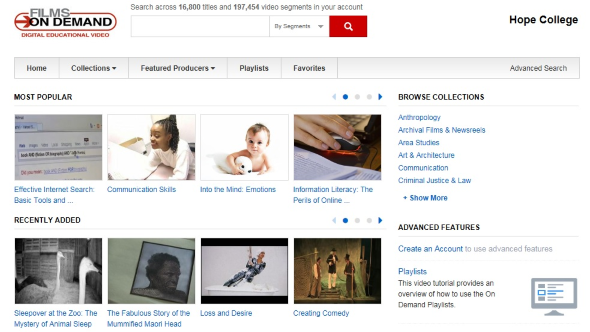 To create playlists, faculty need to create an account from the Films on Demand home page, which can be accessed on the Library Databases A-Z list. It is recommended that a personal account be created so that all functionality is available when accessing Films on Demand from off-campus..
Quickstart guides can be found on the support center page. Want to show your friends what it looks like from your point of view as you ski down the slopes? Or swim at the Dow? Or perform a dance routine? The library now has two GoPro Hero cameras available for checkout. These rugged, waterproof cameras have several shooting modes, including 1080pixel/30 frames-per-second video, 5 shots per second Burst Photo, and a time-lapse setting. All images are recorded on a 16GB microSD card. The library will supply the card or you can use your own (up to 32GB). Once you are done filming, you then upload the files to your computer to compile your video. If you have not used video editing software you can come to the TechLab and they will show you how to use iMovie. If you prefer to learn on your own, you can come to the TechLab and view any of the thousands of video training tutorials available through Lynda.com. Along with the cameras, there are several different styles of mounts that can also be checked out. These include a floating hand grip, chest mount harness, and 3-way grip/arm/tripod. The cameras and mounts are all available at the Media Desk on the 2nd floor of the library and can be checked out for 3 days at a time. Watch the video created by TechLab Assistant Michael Barrows featuring various filming modes and camera mounts using the GoPro Hero camera. The library now subscribes to lynda.com. Two dedicated kiosks are available in the Techlab on the 2nd floor. Lynda.com is an online learning company. Cultivate skills in business, software, technology and more to boost your resume while achieving your personal and professional goals. Experts teach these skills using self-paced online video courses. Browse through the hundreds of videos available in a multitude of topics. Interested in learning Adobe products? Want to learn more about web development? Maybe you want to sharpen your photography skills? These and many other topics are available through our library subscription to lynda.com. Video tutorials are available to help you learn how to use the video library. Any questions? Contact us today! MeLCat Celebrates Its 10 Year Anniversary! MeL is the Michigan eLibrary, a 24/7 online library for Michigan residents. Van Wylen Library has over 600,000 items. Using MeLCat increases the number of items available to you to over 45 million. You can get items from all types of libraries – from public to large academic institutions. MeLCat is a great resource for research materials as well as non-academic, popular books, music and movies. You can get books, CDs and DVDs delivered right to Van Wylen from over 400 other Michigan libraries. Search for your item at http://mel.org/melcat, click on the “Get this from MeLCat” button, select Hope College from the drop down list, enter your 1Hope username (without @hope.edu) and password, and the item will be delivered to the library in about a week. If you haven’t yet used this great service and have questions the Research Help Desk staff will be glad to assist you! Posted on January 7, 2015 January 12, 2015 Author Blogs AdministratorCategories Databases, Digital Tools, Library Highlights, Reference, TipsTags ILL, Interlibrary Loan, MeL, Michigan ELibraryLeave a comment on MeLCat Celebrates Its 10 Year Anniversary! For those of you who haven’t used it before, Naxos is the library’s primary tool for online streaming classical music. It contains over 100,000 CDs from 100s of labels such as Naxos, Sony Classical, Albany, and Inova. Naxos has recently released a new version of its app, available for apple and android. Use this app to easily stream their content on your smartphone. To use, simply create an account through their website and download the app. You can use the app to create search for Naxos content, browse recent additions, or listen to public playlists that Naxos has created. Looking to get in a festive mood? They even have holiday playlists (listed in the Seasons folder). Note: We have a limited number of seats in Naxos, so please log out of the app when you are done using it, to make room for others! Contact Jessica (hronchek@hope.edu) if you are regularly having trouble getting in. Chinese Painting and Calligraphy at the Seattle Art Museum – This is a fantastic online interactive exhibit of 150 works of painting and calligraphy. Not only are the digital images high quality, but there are translations of the texts and seals, extensive descriptive essays, bibliographies and provenance. Internet Broadway Database – Created and maintained by the Broadway League, this documents all shows performed on Broadway. It provides fairly exhaustive information about opening night cast and production staff of original performances and revivals. You can also learn about venues and easily track the Broadway performance histories of any of the professionals documented in this resource. An American Ballroom Companion: Dance Instruction Manuals 1490-1920 (LOC) – A classic from the Library of Congress, this primary source collection mostly has dance instruction handbooks but also includes scores for dance music, etiquette guides, and even anti-dance treatises. The collection is mostly made up of texts published in the US but also contains some European works. Liedernet Archive – In spite of its utilitarian and old-school appearance, this is a great place to start when looking for song texts and translations. What is impressive for a web tool this old is that it is still being updated. Keep in mind that translations are done on a volunteer basis, so I would use it paired with our more academic translation books in the reference section. Hope College students and staff now have full complimentary access to NYTimes.com and NYTimes mobile apps,* thanks to a schoolwide subscription provided by your library. Your access to NYTimes.com is available from any location on or off campus. We encourage you to take advantage of the world-class journalism of The New York Times to enrich your educational experience. NYTimes.com covers a variety of topics with unsurpassed quality and depth through breaking news articles, blogs, videos and interactive features. In addition, you will be able to share content on social networks, save articles of interest, subscribe to email newsletters and set up personalized alerts. Activate your Pass for free access to NYTimes.com by visiting nytimes.com/passes and following the simple instructions. * Mobile apps are not supported on all devices. Does not include e-reader editions, Times Premier content or digital versions of The New York Times Crossword. This program provides only select access to The New York Times Archive and does not replace database services to which your institution may currently subscribe. Other restrictions apply. Do you have an interest in the intersections between music and the visual arts? If so, you should check out the Répertoire International d’Iconographie Musicale (RIdIM). Don’t be intimidated by the French name! 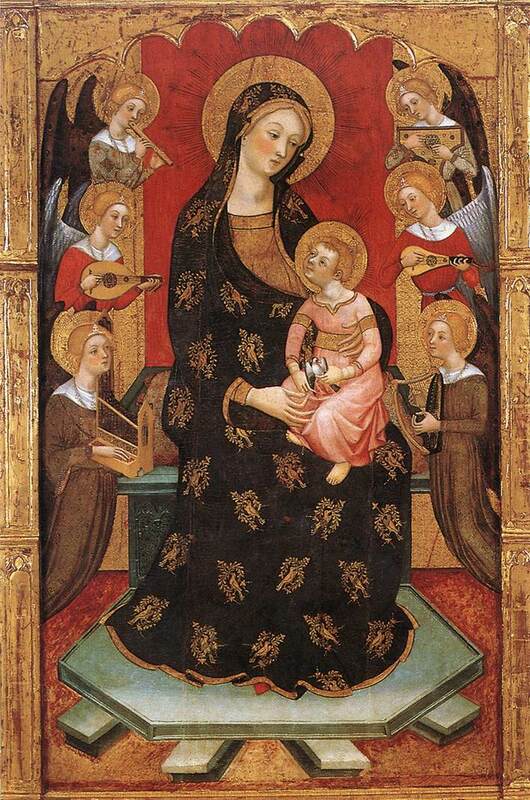 This free online database indexes over 2,100 depictions of musical instruments in works of art ranging from the 14th to the mid-20th century. The database makes it easy to browse or search, by instrument, artist, location, or many other facets. Many of the records include images or links to the artworks on other websites. So, curious about how the bagpipe has been depicted throughout history? Take a look at RIdIM! — Jessica Hronchek, Research and Instruction Librarian, Liaison to the Visual and Performing Arts. STUDENTS – DO YOU KNOW? Question: Can I check out a book and a laptop at the same time? You can borrow items from other Michigan libraries through MeLCAT. Posted on September 29, 2014 September 30, 2014 Author Blogs AdministratorCategories Databases, Digital Tools, Library Highlights, Student News, TipsTags Circulation, Library check-outs, Searching the catalogLeave a comment on STUDENTS – DO YOU KNOW?